A simple piece of rope stands between environmentally friendly Americans and their neighbors. A simple piece of rope hangs between some environmentally friendly Americans and their neighbors. On one side stand those who have begun to see clothes dryers as wasteful consumers of energy (up to 6% of total electricity) and powerful emitters of carbon dioxide (up to a ton of CO2 per household every year). As an alternative, they are turning to clotheslines as part of what Alexander Lee, founder of the advocacy group Project Laundry List, calls "what-I-can-do environmentalism." But on the other side are people who oppose air-drying laundry outside on aesthetic grounds. Increasingly, they have persuaded community and homeowners associations (HOAs) across the U.S. to ban outdoor clotheslines, which they say not only look unsightly but also lower surrounding property values. Those actions, in turn, have sparked a right-to-dry movement that is pressing for legislation to protect the choice to use clotheslines. At least 10 states currently limit the ability of HOAs to restrict the use of energy-saving devices like solar panels, but only three states--Florida, Hawaii and Utah--have laws written broadly enough to protect clotheslines. Right-to-dry advocates argue that there should be more. Matt Reck is the kind of eco-conscious guy who feeds his trees with bathwater and recycles condensation drops from his air conditioners to water plants. His family also uses a clothesline. But on July 9, Otto Hagen, president of Reck's HOA in Wake Forest, N.C., notified him that a neighbor had complained about his line. The Recks ignored the warning and still dry their clothes on a rope that extends from their swing set to a pole across the yard. "Many people claim to be environmentally friendly but don't take matters into their own hands," says Reck, 37. HOA's Hagen has decided to hold off taking action. "I'm not going to go crazy," he says. "But if Matt keeps his line and more neighbors complain, I'll have to address it again." North Carolina lawmakers tried and failed earlier this year to insert language into an energy bill that would expressly prevent HOAs from regulating clotheslines. But the issue remains a touchy one with HOAs and real estate agents. "Most aesthetic restrictions are rooted, to a degree, in the belief that homogenous exteriors are supportive of property value," says Sara Stubbins, executive director of the Community Association Institute's North Carolina chapter. In other words, associations worry that housing prices will fall if prospective buyers think their would-be neighbors are too poor to afford dryers. Project Laundry List's Lee dismisses the notion that clotheslines depreciate property values, calling that idea a "prissy sentiment" that needs to change in light of global warming. "I understand the need for communities to legislate taste, but people always find a way around it," he says. 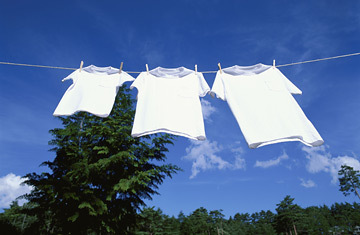 "The clothesline is beautiful--gorgeous, sentimental and nostalgic for many." Indeed, nostalgia can be an additional motivating factor, especially for elderly people who have used clotheslines throughout their lives. Mary Lou Sayer, who is over 85, dried her clothes outside when she was young and hoped to do so again when she moved to a Concord, N.H., retirement village three years ago. She has proposed a change to the community's clothesline ban twice. Her second pitch was voted down unanimously in late October. Her best chance now rests with a bill that state representative Suzanne Harvey plans to introduce in 2008 that would say hanging laundry outside cannot be fully prohibited. "We all have to do at least something to decrease our carbon footprint," Harvey says. "And once you start seeing your nice neighbors hanging clotheslines, that can take down stereotypes." In the meantime, Sayer is considering hanging a line in protest. "Most of my friends aren't taking energy issues seriously," she says.